A New Coffee Spot to Celebrate National Coffee Day! 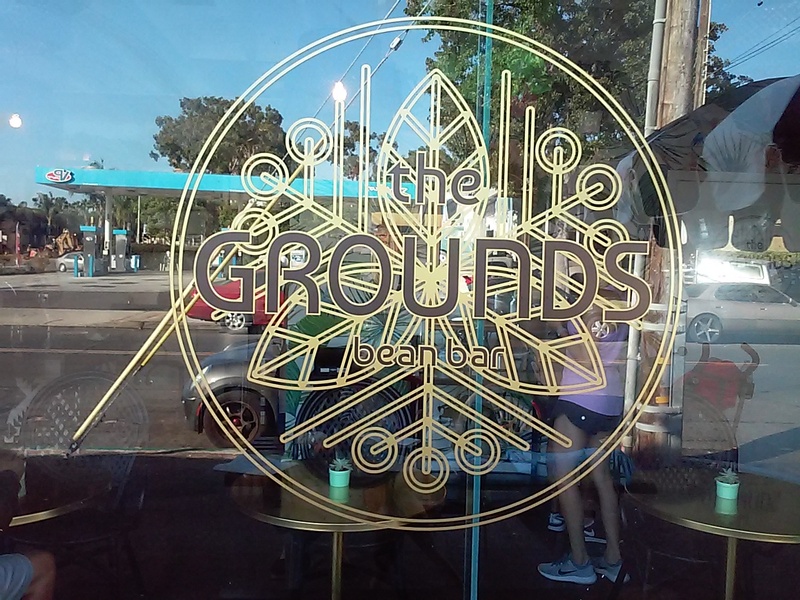 1571 La Playa Ave., near Ingraham St.
September 29 is National Coffee Day and with that in mind we headed to a new coffee shop, The Grounds Bean Bar in Pacific Beach near the corner of La Playa and Ingraham streets, behind the long-established Rocky’s. It’s only been open for a couple of weeks, but it’s fabulous! Carson and Brynn are the co-owners and they are paying attention to what people want and responding. Brynn designed the classy sign for their front window. 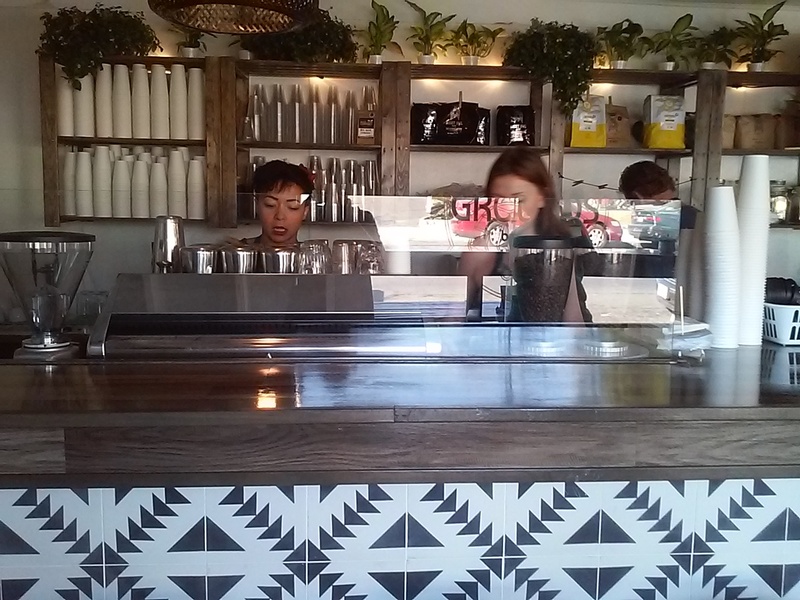 The decor definitely captured my attention with gorgeous black and white tiles on the coffee bar, a wall paper mural of tropical flowers and birds that were designed by them, and touches of gold to make it upscale and welcoming. It definitely is perfection in the atmosphere department! These black and white tiles are stunning! Now, to the coffee! I ordered an iced coffee and it was delicious and a chocolate croissant to go while Patty opted for hot coffee. Both of us were happy coffee drinkers. We sat outside at a large picnic table enjoying the space and the fresh air. We absolutely adored the wheat bread with the sweet ricotta cheese, peaches, a balsamic reduction, and mint . . . oh my! I will return for this and I’m going to be happily checking out their menu in the future. 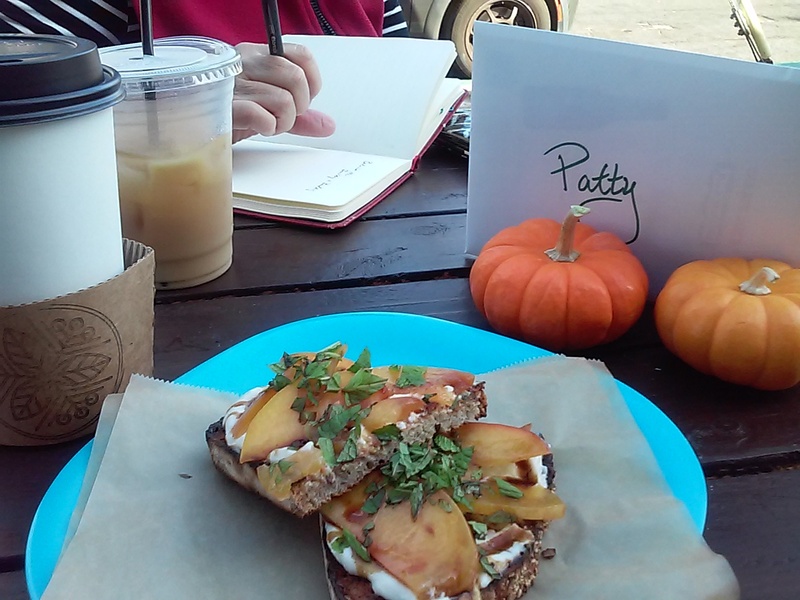 Their cheese, peach toast was a welcome birthday treat, as was their coffee! Carson said they will be featuring local roasters and rotating them so guests will be able to enjoy and become familiar with our local coffee roasters. The day we visited they were featuring James and Virtuoso. This is a Pacific Beach coffee shop that should not be missed! 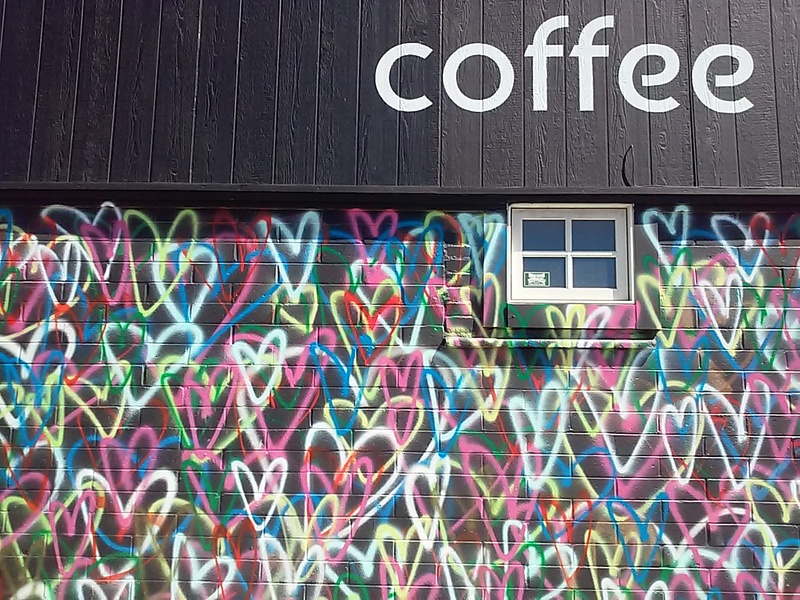 The west side of the building really captured our attention with colorful hearts and the big bold word COFFEE. This entry was posted in art, Coffee shops in San Diego, near the beach and tagged local coffee roasters, Pacific Beach. Bookmark the permalink. 1 Response to A New Coffee Spot to Celebrate National Coffee Day!